Mo Dont No’s sparkling victory in the Best of Ohio Endurance was the highlight of the Saturday afternoon, Oct. 7 Belterra Park program that featured five $150,000 stakes for Ohio-bred runners. The 2016 Horse of the Year kept his Best of Ohio crown intact as he blazed to victory by a length in a new track record clocking of 2:03.32 for the 1 ¼ mile test with Ricardo Feliciano in the irons. Cake Pop (Manuel Cruz) was second by a nose over the fast-closing Let’scalliteven (Chelsey Keiser), with Goon Too Soon (Juan Velez) notching fourth-place money among the field of Ohio-registered 3-year-olds and up. Jeff Radosevich trains the 4-year-old son of Uncle Mo for the Loooch Racing Stable, who upped his earnings to $651,255 with his 14th career victory in 20 starts. It was the fifth consecutive triumph for Mo Dont No, who was bred by the Beechwood Racing Stables. The new track record eclipsed the old mark set by Plain Ol’ Willard of 2:04.87, set on Oct. 11, 2014. 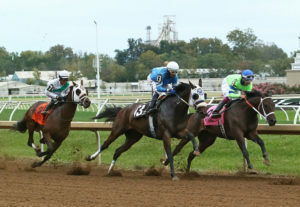 In the $150,000 John W. Galbreath Memorial for 2-year-old fillies, Missap and jockey Dean Sarvis romped to a five-length triumph in wire-to-wire fashion for breeders/owners the Beckette Racing Team, LLC. The daughter of A.P. Warrior picked up her first stakes victory and second career win for trainer Kellyn Gorder, clocked in 1:46.06 for the one and 1/16 mile test. Longshot (25-1) Ucantkeepup (Luis Quinones) was second, with 8-5 Tango Run (Rex Stokes, III) third and 7-2 Put A Hex On My Ex (Ricard Feliciano) fourth. Missap now sports a bankroll of $120,880 for her connections. Favorite Awaken was never far off the pace and used that tactic to his advantage in the $150,000 Juvenile Stakes, overcoming the leaders in the late going to score his third career win against rival 2-year-olds. The Super Saver colt was ridden by James Graham for trainer Tim Hamm and the WinStar Farm and Blazing Meadows Farm, and timed in 1:45.28 for the one and 1/16 mile contest. Tiz A Rush (Luis Rivera) was second, nine lengths ahead of third-place finisher Charlee’s Magic (Ricardo Feliciano) with Rosco P. Coltrane (Perry Ouzts) fourth. Awaken also captured the $75,000 Cleveland-Kindergarten Stakes earlier this season, and now has three wins in five starts and $175,500 in his coffers. Hijo De Sheltowee (Pablo Morales), a 10-1 longshot, upset 1-2 favorite Rivers Run Deep (Perry Ouzts) in the $150,000 Best of Ohio Sprint, besting the Buckeye State’s best short distance horse by a nose in the final strides. The 5-year-old Devil His Due gelding charged gamely in the final strides of the six furlong romp, to beat his rival by a whisker in 1:10.18 en route to his first career stakes triumph. Nuttin’ Faster (Julie Burke) was third, with Jocker Justice (Deshawn Parker) fourth. Trained by Nabu Morales for owner Michael Friedman, Hijo De Sheltowee now has $332,846 in career earnings from 14 wins, five seconds and four thirds in 38 lifetime starts. Mayas Queen Neetee (Luis Colon) devastated her competition by nearly six lengths in the $150,000 Best of Ohio Distaff, tripping the timer in 1:51.10 for the one and 1/8 mile event. The 5-year-old daughter by Spreightstown got the best of the late-charging, second-place finisher School Board Prez (Pedro Cotto, Jr.), while 90-1 longshot Flashy G (Luis Rivera), who had the lead throughout most of the mile, held on gamely for third, with Leona’s Reward (Pablo Morales) getting up for fourth place honors. Trained by Jeff Radosevich, Mayas Queen Neetee is owned by Loooch Racing Stable and now sports a bankroll of $230,292 from six wins in 12 starts. She was bred by the Anstu Farm.